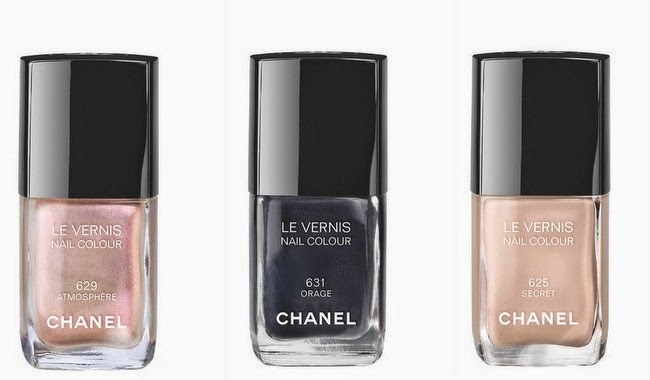 Chanel’s Haute Couture shows are watched with bated breath by the beauty as well as the fashion community: it’s where we get the first glimpse of next season’s most covetable nail colour. And here it is: the shade we’ll all want on our fingers come autumn is Le Vernis in Atmosphère, which lands on August 15th as part of the Etats Poetiques Makeup Collection for AW14. The only limited shade of three new offerings, all €23, Atmosphère is described as a ‘pearly nail colour with unique multiple shimmers’ which ‘embodies the magic of love’. It will be joined by a soft milky pink, Secret, and Orage, a deep inky grey that I predict will capture just as many hearts as its harder-to-get-your-hands-on sister. The rest of the makeup at the show was a surprising combination of edgy and ethereal: think velvety, highlighted skin (thanks to Perfection Lumiere Velvet and Eclat Lumiere Correcteur Perfection) combined with striking silver and yellow eyeshadow, and graphic black liner.